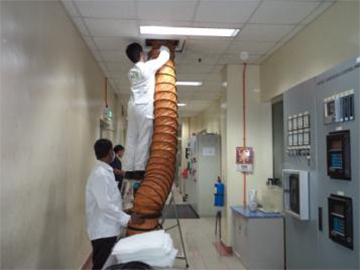 With proprietary IAQ technology, Exceltec’s mechanical ventilation duct cleaning specialist team is able to access and clean the most remote and complicated air ducts. Our technology allows us to clean ducts of all shapes & sizes and negotiate bends & corners with ease. Even vertical duct sections do not pose a problem. The system is also able to dispense disinfectant to ensure the highest levels of sanitation. 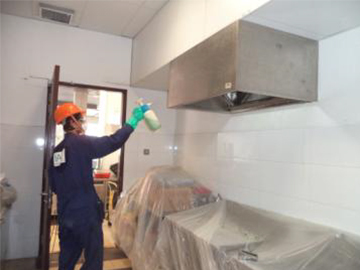 Exceltec’s KED specialist team is able to perform quick and efficient removal of grease and grime in commercial kitchens. We understand that having the kitchen up and running is important for business, our experienced team of professionals ensures that operations experience minimal down time. This efficiency coupled with thorough cleaning of grease filters and kitchen vent hood ventilation systems ensures the highest of kitchen hygiene standards. All Kitchen Exhaust Ducts and Hoods will be required to be degreased and cleaned once every 12 months under SCDF Circular: CD/FSSD/12/02/03/01. It is critical to ensure the mandatory cleaning is carried out, as insurance claims may be affected if a fire breaks out and SCDF investigation findings reveal otherwise. As the leader in KED Cleaning Solutions in Singapore, the Exceltec KED team assures our Clients the strictest adherence to government regulations. Periodic follow-ups to ensure the requirements are met before the stipulated time is part and parcel of Exceltec’s KED package, enabling our Clients a peace of mind. Want more information? Click the link below to get the PDF File.